Designed specifically for solar lighting applications the LMS2025 is a one stop device for charging and driving high voltage LED lighting and their attached batteries. Combining our award winning MPPT charger with a stable constant current LED Driver. 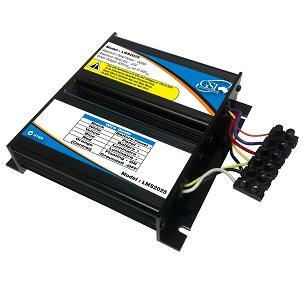 Built to run a LED lighting/Luminaires 0.45A at voltages from 15V to 55V from a 12V Battery with 95% efficiency. Coupled with keeping a battery charged from a 200W panel (maximum Voc of 55V) also at 98% efficiency (typical). All of these power packed features fit into a small form factor measuring just 170mm x 175mm x 40mm making it compact and capable of fitting into the tightest of situations. The driver has a digital remote wire allowing the light to be switched off. Via either a grounded switch or attached to a Light Sensor Switch connected to ground to enable the light to be turned on or off automatically at night time.